Peter Bridgman explores the connections between St Etheldreda’s and William Shakespeare. This pamphlet was written in 2004 and is re-published here with kind permission of the author. This pamphlet explores a number of links between the world’s greatest poet and an inconspicuous Catholic church hidden away behind Holborn Circus. If that statement sounds unlikely, the reader is urged to read on. Some of these links are to be found in the poet’s work, others are to be found in his life: specifically, in the poet’s often hidden connections to the persecuted Elizabethan Catholic community. If some of these links are less direct than others, all are intriguing, while most may be seen as significant clues to the inner life and beliefs of this very secret and guarded man. 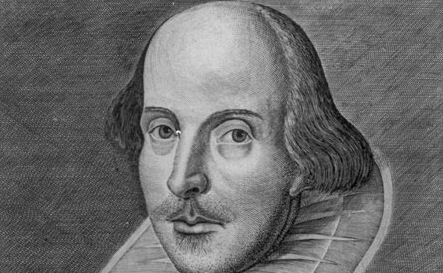 As a Catholic child in the 1560s and 1570s, young William Shakespeare learnt the lives of the saints from his parents and Jesuit-linked schoolmasters. These were stories that generations of English children had heard before him. What was new for William and his contemporaries was that they had no images of the saints to illustrate the tales. When Elizabeth I came to the throne the paintings and statues were removed from Stratford-upon-Avon’s Trinity Church. In 1563, a few months before William was born, the ‘idolatrous’ frescos were whitewashed over in the town’s Guild Chapel. Very soon it would even be an offence to own such ‘popish trish-trash’ as the picture of a saint in your own home. The government knew that once the images were gone it was just a matter of time before the saints disappeared altogether from England. The cult of St. Etheldreda (familiarly known as St. Audrey) was centred in East Anglia. Etheldreda was an Anglo-Saxon princess who died in Ely in 679 of plague, during an outbreak which carried off several members of the monastic community she established. A tumour in her neck was removed by a doctor shortly before her death. According to the Venerable Bede, when her body was examined seventeen years later, it was not only found to be uncorrupted, the wound from the surgery was found to have healed. Etheldreda herself had attributed the neck tumour to divine punishment for her youthful fondness for costly necklaces. This line from The Winter’s Tale (4.4.241) is not spoken by an Anglo-Saxon princess; it is spoken by a shepherdess called Mopsa. But the reference to St. Etheldreda is a direct one: ‘Tawdry’ was a corruption of ‘St. Audrey’ and a tawdry-lace was a lace necklace sold at St. Audrey’s fairs, usually held in late June. In medieval times the necklaces were believed to cure illnesses of the throat and neck. After the cultural revolution that was the Reformation, anything so tainted by the old faith was now ‘trish-trash’, and the word ‘tawdry’ was to take on a pejorative meaning. The building next door to St. Etheldreda’s is Audrey House. St. Etheldreda’s chapel, which dates from the 13th century, is the only surviving building from the vast medieval complex of Ely Palace in Holborn, the London palace of the Bishops of Ely. John of Gaunt, the most powerful magnate in late 14th century England, came to live in Ely Palace after his own London residence, the Savoy Palace on the Strand, was burnt down during the Peasants’ Revolt of 1381. John was to stay at Ely Palace until his death seventeen years later. It is thought that John’s body may have lain in state in the Crypt before burial. How happy then were my ensuing death! It was clear to Shakespeare’s contemporaries that these lines applied as much to the reign of Elizabeth I as to that of Richard II. The Queen herself recognised this in her famous remark about the play, ‘I am Richard II, know ye not that?’ The scene in which the king was deposed was to make Elizabeth particularly nervous. After calls for the queen’s deposition from the Jesuit Robert Persons, performances of the play were discouraged and performances of the deposition scene were banned. In 1611 historian John Speed was to refer to Fr. Persons and Master Shakespeare as ‘the Papist and his poet’. The Bishop of Ely in the play was John Morton, a mentor of St. Thomas More, and the chief source of Tudor propaganda against Richard III, the last of the Plantagenet kings. Historians now believe it was Morton who first depicted Richard as a hunchback and villain. Morton’s coat of arms is included in a window in the north wall of the Upper Church. When Richard III was written in 1591, the See of Ely was vacant. The last Anglican bishop, Richard Cox, was a leading agent of the Reformation and one of the authors of the ultra-Puritan 1552 edition of the Book of Common Prayer. Cox had fallen out with Elizabeth I when he condemned the forbidden crucifix and candles she insisted on keeping in her private chapel. In 1580, after the Bishop refused to grant Ely House to the queen’s favourite dancing partner, Christopher Hatton, Cox was forced to resign. Hatton was given Ely House (hence Hatton Garden) and the See was to remain vacant for nineteen years. A ‘Strawberry Fayre’ is still held every June in Ely Place for charity. In the Upper Church at St. Etheldreda’s, on the corbels between the windows on the north and south walls, stand statues of eight English martyrs from the Reformation period. 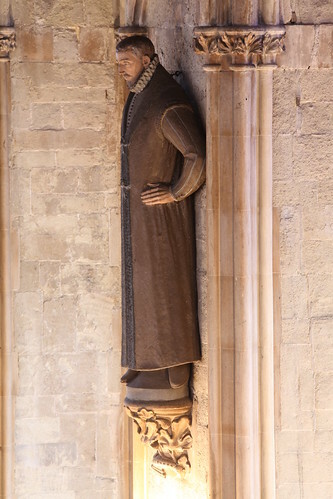 The second statue from the altar on the south wall is of St. Swithun Wells. Swithun was the tutor at Southampton House in Holborn, employed by the second Earl of Southampton and his wife Mary, to teach their young son Henry Wriothesley (pronounced ‘Risley’). Young Henry was to be Shakespeare’s future patron. Southampton House, on the corner of Holborn and Chancery Lane, is no longer standing but Southampton Buildings nearby marks its position. The house was the centre of London’s Catholic culture, the Southampton circle including poets and musicians such as the Catholic composer William Byrd. In 1581, after aiding the Jesuit martyr St. Edmund Campion, the Earl died in mysterious circumstances. Eight year old Henry, now the third Earl, was removed from his Catholic home and became a royal ward in the care of Elizabeth’s first minister Lord Burghley. Taking charge of Henry’s education, Burghley immediately sacked the young Earl’s Catholic tutor. Swithun Wells took a house in nearby Grays Inn Fields with his wife Alice and worked as a schoolmaster, no doubt remaining in contact with his co-religionists at Southampton House. In 1590, when Henry was seventeen, Burghley tried to marry his fifteen year old grand-daughter Elizabeth Vere to the young Earl. Henry’s mother, who was in favour of the marriage, may then have contacted Shakespeare, through a mutual Catholic acquaintance, to commission work from the poet. The first seventeen of The Sonnets were written to persuade a young aristocrat to marry, and there is every reason to believe that this nobleman was Southampton. This would mean that the first sonnets were written as early as 1590; and would mean that the poet was most likely acquainted with Swithun Wells. As it turned out, after secretly taking advice from Shakespeare’s cousin, the Jesuit St. Robert Southwell, Henry refused the marriage offer and moved back in with his mother at Southampton House. Since the house was constantly under surveillance by Richard Topcliffe’s secret police, local mass-houses had to be found elsewhere. Swithun’s house in Grays Inn Fields became such a centre. In 1591 Edmund Gennings was celebrating Mass in the house when Topcliffe and his officers burst in. The congregation held the door and beat back the invaders until Mass was finished, when they surrendered quietly. Swithun himself was absent at the time, but on his return he was immediately imprisoned. His wife Alice was also condemned but reprieved; she was to die in prison ten years later. Convicted of treason, Edmund Gennings was hanged, drawn and quartered outside the Wells’ home in Grays Inn Fields in December 1591. Swithun was hanged alongside him as a common criminal. Edmund was only twenty-four. His statue stands next to that of Swithun Wells in the Upper Church. Which die for goodness, who have lived for crime. On the north wall, directly opposite the statue of Swithun Wells, is a statue of St. Anne Line, martyred at Tyburn in 1601. Anne was a widow and seamstress who looked after a house of refuge for priests in the City. The house was established by the Jesuit John Gerard. It is now believed that Shakespeare wrote his metaphysical poem Phoenix and Turtle to commemorate a private ceremony in which Anne was buried by Catholic nobles (see TLS April 18, 2003). The poem first appeared in the same year as Anne’s execution, in a collection called Loves Martyr. After Fr. Gerard’s escape from the Tower in 1597, as the authorities were beginning to suspect Anne’s assistance, she removed to another house, which became a rallying point for neighbouring Catholics. On Candlemas Day, 1601, Fr. Francis Page was about to celebrate Mass there when priest-hunters broke into the rooms. The priest quickly unvested and mingled with the others, but the altar prepared for the sacrament was all the evidence needed for Anne’s arrest. On 27 Feb 1601, she was led to the gallows. The route to Tyburn may be thought of as England’s Via Dolorosa. It left the City at Newgate, crossed the Fleet river (which now runs under Farringdon Rd) at the bottom of Snow Hill, and passed by St. Etheldreda’s into Holborn. It then continued westward through Tyburn Rd (now Oxford St) before ending at Tyburn Tree near the present Marble Arch. The ‘tree’ was a huge triangular gallows, each of the three sides wide enough to hang eight bodies. The stunning West Window at the rear of the Upper Church at St. Etheldreda’s depicts the executions at Tyburn Tree. Taken down from the ‘tree’, Anne’s body was thrown into a common grave with the others killed that day. It appears that the Countess of Arundel then ‘rescued’ the body and took it to her home, where it was kept until it could be buried by the Catholic community. We do not know if Shakespeare was present for either the execution or the burial, but we do know, from his poem that commemorates the latter, that he was moved to pity by Anne’s death. Anne is the phoenix of the poem (representing immortality) while her late husband Roger Line, a Hampshire connection of the Southamptons, was the turtledove (representing fidelity). Like Etheldreda and her husband centuries before, Anne and Roger had sworn a vow of ‘married chastity’. Here enclosed in cinders lie. Beauty brag, but ’tis not she. Truth and beauty buried be. For these dead birds sigh a prayer. Prayers for the Dead were of course forbidden when Shakespeare wrote these lines in 1601. It may be a happy coincidence but Daphne Pollen’s painting of The Forty Martyrs of England and Wales depicts Anne Line cradling a dove in her arms. (At the time of writing, prints of this painting are on display in the crypt at Tyburn Convent and in the exhibition near St. John Southworth’s tomb in Westminster Cathedral.) The poet’s phoenix metaphor was indeed apt. Among the Forty Martyrs of England and Wales, Anne was canonised by Pope Paul VI in 1970. 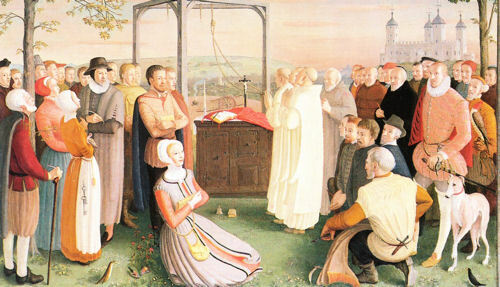 Daphne Pollen’s painting of The Forty Martyrs of England and Wales. Swithun Wells is at the extreme right, holding a hawk. In 1613 Shakespeare bought a property in Blackfriars: the Gatehouse, on the corner of Ireland Yard and St. Andrew’s Hill. It is no longer standing but the present-day Cockpit pub roughly marks its position. This is an intriguing purchase for two reasons. Firstly, this was the only property Shakespeare ever bought in London, but he never lived there (in 1613 the poet was in semi-retirement and had already moved back to Stratford-upon-Avon). Secondly, the building was a Catholic mass-house, constantly raided by government priest-hunters. The Jesuit John Gerard, who employed Anne Line as a priests’ housekeeper, was a frequent visitor. In 1605 the Gunpowder Plotters wanted to meet at the Gatehouse but their request was refused. Shakespeare does not seem to have bought the property as an investment. After the purchase he immediately re-let the property to its tenant, John Robinson, and at a peppercorn rent. We can only guess why Shakespeare channelled the profits from his plays into a mass-house (the Gatehouse cost him more than twice as much as his large home in Stratford) but there may be a clue in the fact that in his will he passed it on to his daughter Susanna. The name of the poet’s daughter (like that of her grandfather John Shakespeare) was to later crop up in the lists of recusants who refused to attend Anglican services in Stratford-upon-Avon. Shakespeare’s will was witnessed by a John Robinson. We do not know if this was the tenant of the Gatehouse but there was a Catholic tradition that Shakespeare received the last sacrament from a mysterious Benedictine. Later in the century, Anglican vicar Richard Davis was to write that Shakespeare ‘dyed a Papist’. On Sunday 26 October 1623, seven years after the poet’s death, a major tragedy was to occur in Blackfriars. A clandestine congregation of some three hundred Catholics assembled for Mass in a secret upper garret ‘over the Gatehouse’ (and unless more than one Blackfriars Gatehouse was used as a mass-house, this would appear to be the property Shakespeare bought). The weight of the congregation was too much for the oak beam that supported the garret floor: it snapped, and at least ninety of the worshippers, together with two priests, plunged through two floors to their deaths. As bodies were being recovered from the rubble, the Anglican Bishop of London, George Montaigne, forbade any of the dead to be buried in the City’s cemeteries. Two pits were then dug at the site of the accident and sixty three of the ninety five bodies were tossed into the pits. When news of the tragedy reached St. Etheldreda’s, which in 1623 was the residence of the Spanish ambassador, Diego Sarmiento de Acuna, the ambassador made secret arrangements to bury the Catholic dead. Eighteen of the bodies were carried across the Fleet river up to St. Etheldreda’s and buried beneath the Crypt and cloister garth. The remains of these eighteen men and women who perished at Shakespeare’s Gatehouse still lie under the flagstones at St. Etheldreda’s. Sadly, the victims of the ‘Doleful Evensong’, as the tragedy came to be called, were to be denounced from Protestant pulpits. Anglican homily writers explained the terrible accident as the Lord’s vengeance on Catholics for the Gunpowder Plot of 1605. 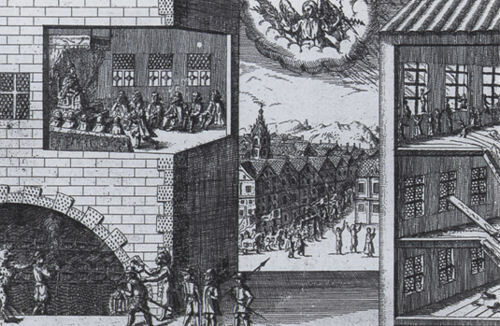 A contemporary Dutch print explains the 1623 Blackfriars tragedy (on the right) as God’s vengeance on English Catholics for the Gunpowder Plot of 1605. All quotations are taken from The Norton Shakespeare (1997).